Now you can convert your Magento e-commerce store into a hybrid mobile app and deliver a combination of both native app and web app experience to your customers. 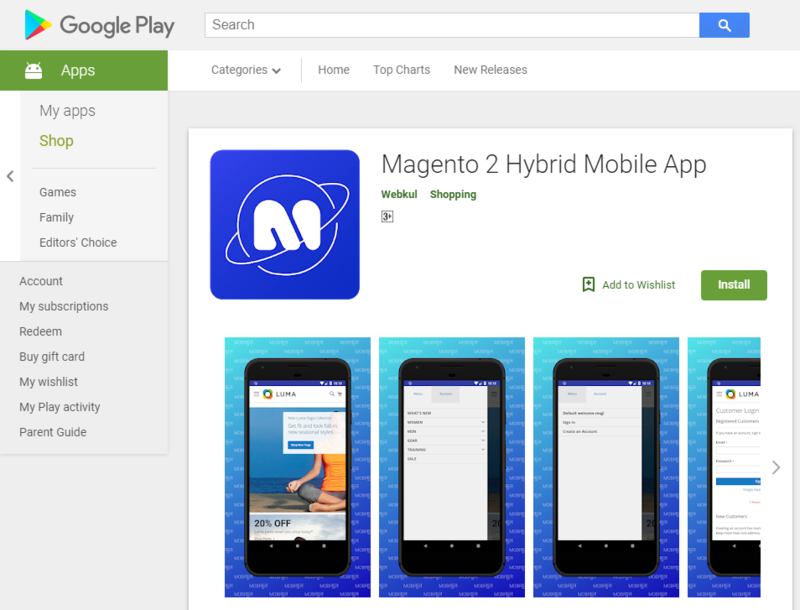 Magento 2 Hybrid Mobile App uses your existing website theme and can be downloaded from the Google Play Store and Apple App Store easily. All the Magento storefront features and functionalities are available in the hybrid mobile app. *All Add-ons comes under paid customization features. You can publish your mobile apps either from your own account or choose Webkul’s Google Play and Apple iTunes account. You can get the APK and IPA files once the apps are developed completely. Now, let us walk through the Magento 2 Hybrid Mobile App and see all the features and functionalities it has. Once the customer downloads the app and launches it, the welcome splash screen is visible as below. The splash screen is an image that will show for a set time when the app is starting. After that, the customer is redirected to the app home screen. This feature is very useful for showing the branding icon/logo of your business before showing the content of the app. For navigating through various options of the e-commerce store, a customer can use the Left Menu Drawer. In the Menu section, all the categories and sub-categories are there. While in the Account section, the customer can Sign In or Create an Account on the e-commerce store, within the app! Please note – The Left Menu Drawer feature will be dependent and may vary as per the website theme you are using. A customer can easily login to the store by entering email and password. Further, create a new account by entering very few details (first & last names, email, password) and start shopping. Magento 2 Hybrid Mobile App also supports – social login as well through customization. Allowing customers to login via Facebook, Google, Twitter, and other social media accounts. After signing in, the customer can go to My Account section and manage – account information, orders, downloadable products, wishlist, address book, stored payment methods, billing agreements, product reviews, and subscriptions. From My Account>Address Book, the customer can manage the default billing address and shipping address. Multiple addresses can be saved and edited, plus everything is synchronized everywhere. All the changes will be updated in the customer account, whether browsing it from the e-commerce website or hybrid mobile app. From the category page, the customer can view multiple products including images, price, review, and ratings. Sorting option is available for showing products according to name (alphabetically), position, and price. For filtering and finding the products quickly, the customers can use Shopping Options feature. Using, this products can be filtered according to various attributes as configured under Advanced Layered Navigation setting. A customer can filter the products based on the color options available and view filtered products according to price range. On the product page, detailed information about the product is visible. A customer can view multiple images of a product, read reviews, add the item to wishlist, and select available options to purchase. Magento 2 Hybrid Mobile App works with all the product types – simple, configurable, downloadable, virtual, bundle, and grouped. While on a product page, the customer can add the product to wishlist and buy it later. Multiple products can be added to the wishlist and can be shared with friends as well. For viewing the wishlist, the customer can navigate to Left Menu Drawer and then go to My Account>My Wishlist. The shopping cart icon is available on the top right corner. After adding the products to the shopping cart, the customer can check the product details, quantity, and estimate the shipping & tax amount. The complete checkout process can be performed on the mobile app. First, the customer needs to select the shipping address for the product delivery. After that, various shipping methods will be visible, both types are supported – basic and third-party carrier based. Real-time freight rates are fetched from the shipping carriers website via API. Note – All the shipping methods that are available on the Magento web store will be visible on the mobile app as well. No separate module/integration work is required. Note – All the payment methods that are available on the Magento web store will be visible on the mobile app as well. No separate module/integration work is required. Magento 2 Hybrid Mobile App is designed to support PCI DSS (Payment Card Industry Data Security Standard) Compliance to accept, process, and transmit cardholder’s data in a secure environment. Once the payment is settled or confirmed, the order can be placed successfully. The customer can continue shopping or view order details by clicking on the order number generated. The customers can share their shopping experience and comment about the product purchased by submitting a review. Ratings on a scale of five stars, summary, and product review become visible after the admin moderation. Thank you for reading this documentation. Please note, this user guide is based on default Magento Luma theme. All the Magento store features will vary and depend on your custom theme installed on the website.